This wedding story began last April, surrounded by tulips, in the beautiful countryside of Holland. This is precisely where Lissette said yes to Chris! We are so happy that she accepted his proposal because it led them to the magical day we are sharing with you on the blog today. 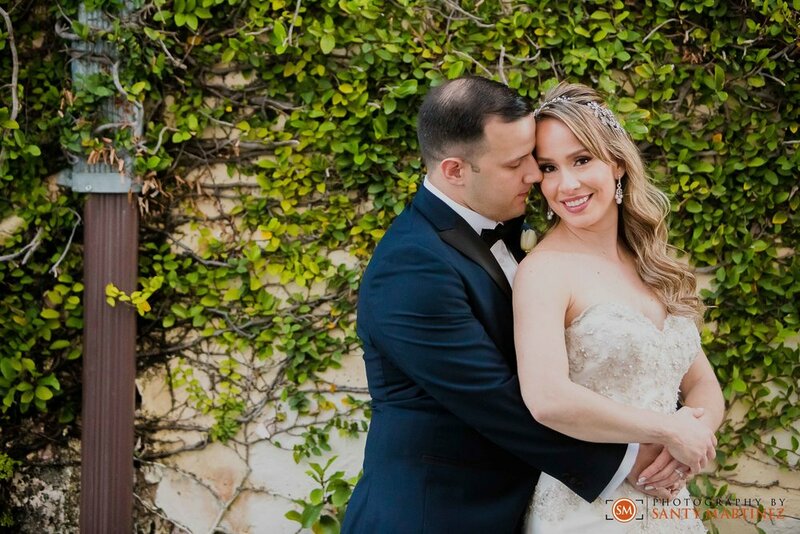 This Coral Gables wedding was a balance of elegance and fun – just like the couple! 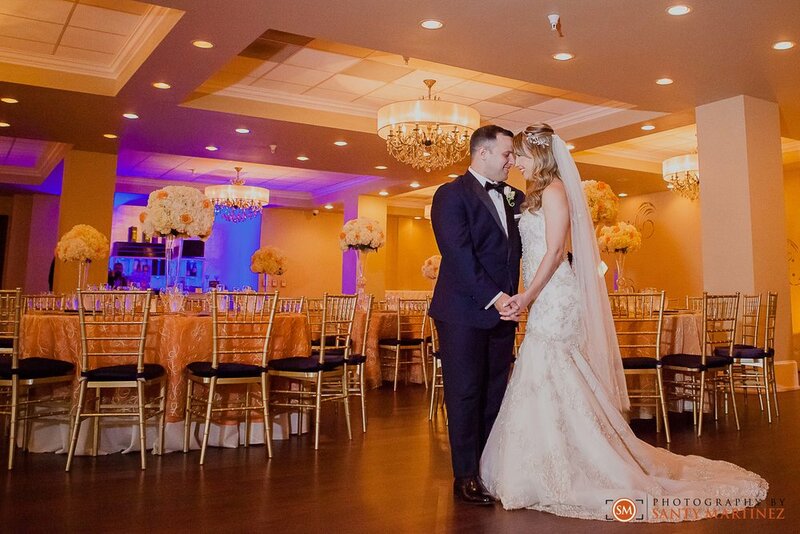 Lissette and Chris began their day at the Hotel Colonnade. 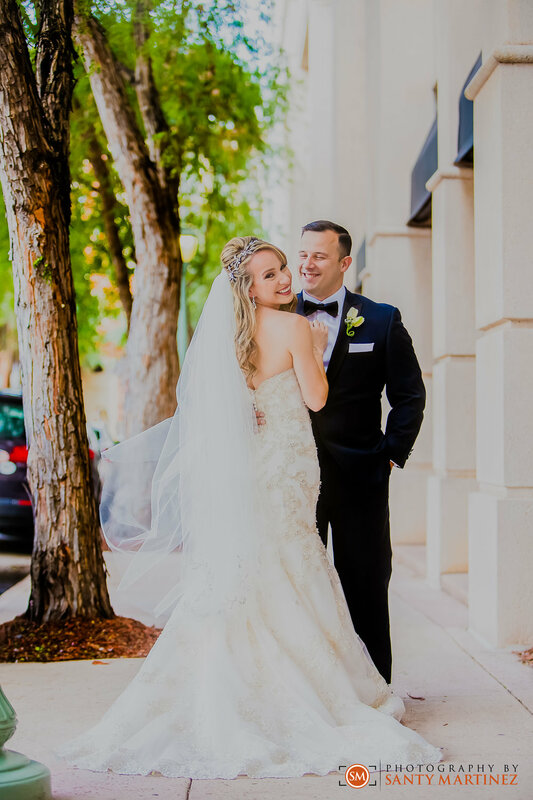 This sophisticated hotel located in the heart of Coral Gables, FL offered a great gathering place for the bride and groom along with their bridal party and family. Lissette got ready in a hotel suite that boasts two floors and huge windows that allowed ample natural light to shine in. This was very helpful in terms of photographing the scene and for the comfort of make-up artist and hair artists doing their job to make everyone look their best. 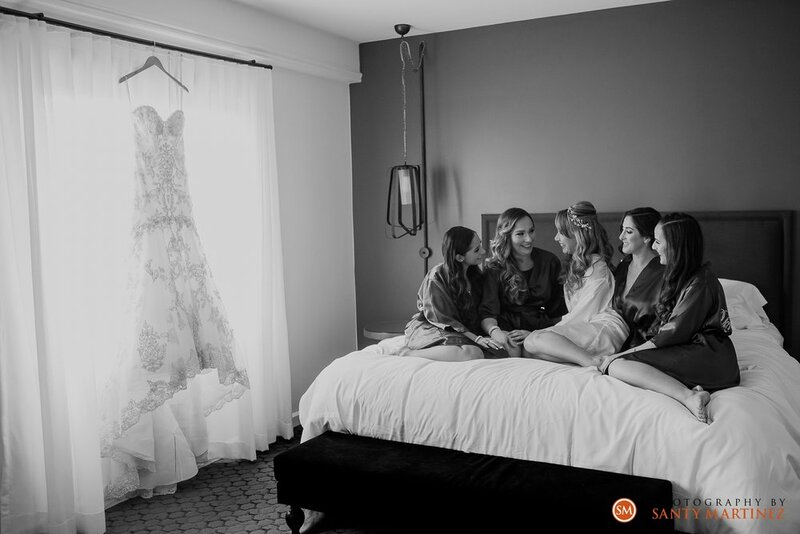 This was also the time we took advantage of photographing all the beautiful details and those little moments shared with her girls. The Westin Colonnade was also the location for the First Look. 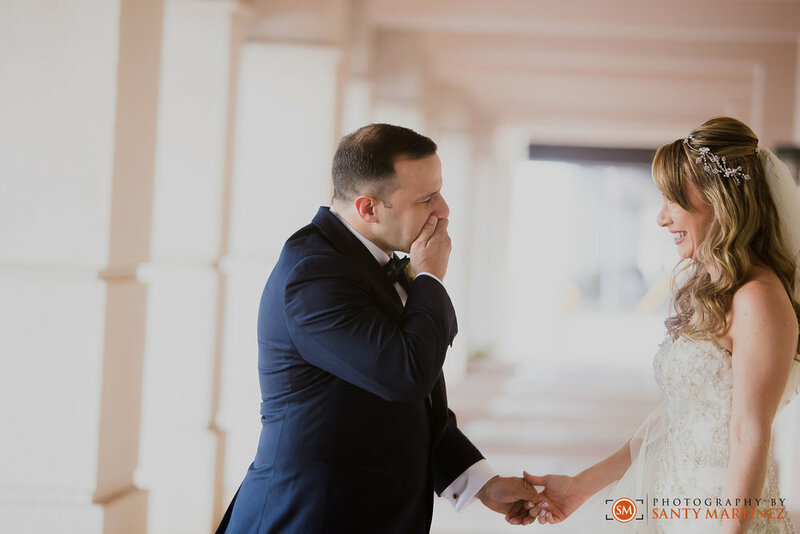 Some grooms cry when they see their bride for the first time – and Chris was one of them! Just by looking at how beautiful Lissette looked that day, we really can’t blame him. Both avid Cross-fitters, these two met through their shared love of fitness. All that working out paid off because they both looked stunning in their wedding attire! You may even notice the pretty tulips in Lissette’s bridal bouquet – both her favorite flower and a homage to where they got engaged. Such a special touch! Guests were gathered at the ceremony site situated under a majestic tree in Coral Gables. This is where Lissette and Chris vowed to grow in love together for the rest of their lives. It was an intimate and heartfelt ceremony. It was evident that each guest was full of joy seeing these two become one as they sent them back up the aisle with a bubble send off. The rest of the evening was spent celebrating the newly married couple at La Jolla Ballroom just blocks from Miracle Mile. This popular wedding venue is chic and modern with a classic twist. We had a chance to sneak the couple away for some final portrait shots both inside and outside the venue as the rest of the guests enjoyed the cocktail hour. We mentioned that Lissette and Chris are both Cross-Fit fanatics – but we have not mentioned that this bride is a dancer too. Even knowing this did not prepare us for the perfectly choreographed dance she and her new husband pulled off as their first dance. There was a lift and all! We are pretty sure all their guests were equally impressed. Once the formal dances, toasts and dinner were through – it was time for the party to begin. Guests enjoyed dancing to the music and striking a pose at our Photo-Booth. 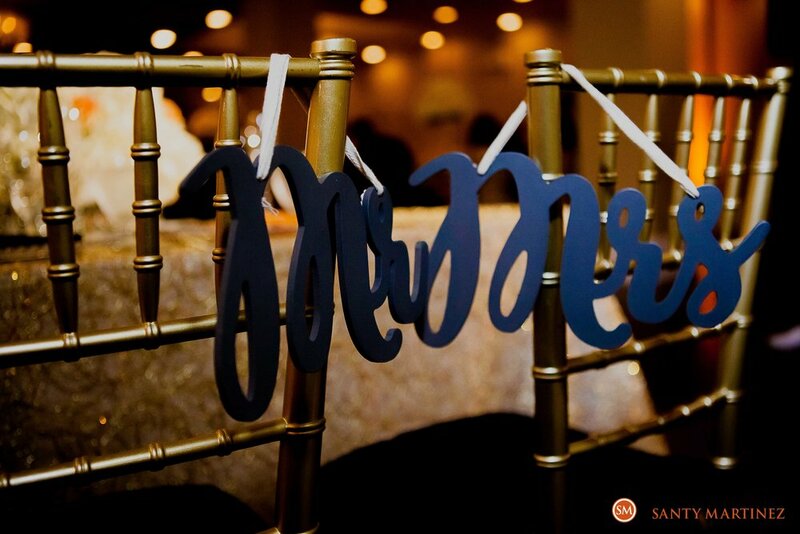 We love when our clients take advantage of our Photo-Booth services as we truly believe it is one of the best wedding favors you can gift to your guests. Lissette and Chris took it one step further and gave each of their guest a 4x6 frame to place their keepsake photograph in. What a great way to commemorate such a fun event! We are so happy that we got to document this very special day. We wish this couple nothing but the best in life. Please check out the following highlights from their day and also a fun teaser of their wedding video. Enjoy!